Visiting Guadalajara on Tuesday, July 12 to accept an award in recognition of his campaign against drug violence, renowned poet and journalist Javier Sicilia urged the government to provide greater funding for public universities. 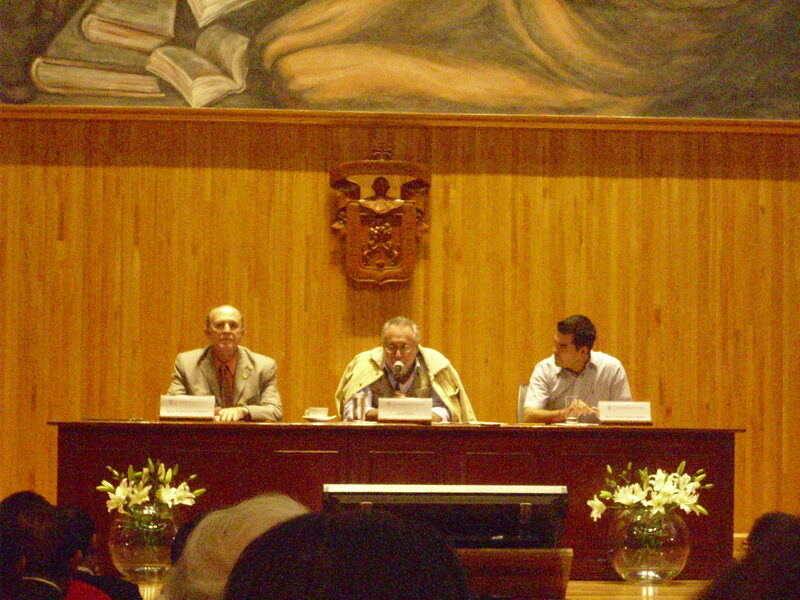 Talking in the University of Guadalajara’s majestic Enrique Diaz de Leon assembly hall, Sicilia condemned President Felipe Calderon’s security strategy, citing investment in employment and education as the best means of reducing drug violence and calling for the president to “hand over the money this university is owed” – a reference to the bitter dispute over funding between the university and the Jalisco state government last year. An acclaimed poet and writer for Proceso magazine and La Jornada newspaper, Sicilia found himself the unlikely leader of Mexico’s anti-violence movement following the murder of his son earlier this year. The body of Juan Francisco Sicilia Ortega, 24, was found in a vehicle alongside six others near Cuernavaca in the central state of Morelos on March 28. Several of the corpses showed signs of torture. The victims were considered mere collateral damage in a war that has claimed the lives of around 40,000 Mexican citizens since President Calderon announced the war on drugs in December 2006. Sickened by the needless death of his innocent son, Sicilia gave up poetry and announced a new civic resistance movement to transform public consciousness and kick-start a dialogue in the absence of effective government policies. Protests have since occurred in over 40 Mexican cities, including a demonstration of around 50,000 people in Cuernavaca, the largest in the city’s history. Armed with slogans such as “No más sangre” (No more blood) and “Estamos hasta la madre” (We’ve had it up to here), Sicilia and his supporters called for an end to the drug war, the withdrawal of military forces from the streets, the legalization of drugs, and the removal of President Calderon. The activists want the government to abandon the military strategy which has provoked a sharp increase in the levels of violence over the past four years. Instead they favor tackling the poverty that drives young Mexicans to join gangs, and eliminating the endemic official corruption that inhibits a sound response to organized crime. In May this year Sicilia led a convoy of around 20 buses on a journey of over 1,500 miles from Cuernavaca to Ciudad Juarez. The peace caravan, as it was dubbed, arrived in Mexico City on May 8, where around 200,000 people attended a demonstration in the Zocalo. Subsequently crossing the border into El Paso, Texas, Sicilia admonished the United States for its “grave responsibility” for failing to tackle the drugs crisis. High consumption levels north of the border drive the drug trade, with rival cartels competing for control of this lucrative market. Furthermore, recent reports indicate that 70 percent of arms seized in Mexico over the past two years have been traced to the United States, where gun laws are more relaxed. After making his voyage across the country, Sicilia recognized that the money consumed by President Calderon’s “stupid, failed war” could instead be better invested in education and employment. In a quiet, dignified address, Sicilia identified Mexico’s youth as those worst affected by the drug violence, noting that “the majority of the 40,000 dead, plus the 10,000 who have disappeared, are young people.” Sounding weary after the events of the preceding months, Sicilia argued the best way to help and protect the nation’s youth is through education. He also commented on last year’s dispute between the Jalisco state government and the University of Guadalajara, which eventually had to settle for 210 million pesos less than the amount it claimed it was owed. “If the president wants to begin to bring justice and rebuild the social fabric of this country, he must hand over this money to the university,” Sicilio declared to great applause. “We want the same money for the country’s universities, its students and its youth, as is spent on this violence,” he added. Following his speech, Sicilia was presented with the “Lion’s Heart” award by the president of the Federation of University Students, Marco Antonio Núñez Becerra. Sicilia is the first recipient of this title, which honors persons whose work in academic, social or cultural fields has benefited the Mexican people’s quality of life. Honoring victims of the drug violence is a key aspect of Sicilia’s campaign. After returning from his journey, Sicilia met with Calderon in Mexico City’s historic Chapultepec castle on June 23. The pair reached an agreement to create a victims’ law and construct monuments in memory of the victims, with plaques naming every one of them. But this proved to be the extent of Sicilia’s influence. The president refused the poet’s principal demand that he modify his strategy against organized crime. Although he apologized on behalf of the state for being unable to protect the lives of victims, Calderon also refused to apologize for sending armed forces into Mexico’s streets to combat the cartels. In his closing remarks at the conference, Sicilia called for greater democratic participation, noting that “Guadalajara has many large civic organizations.” He urged civic organizations throughout Mexico to continue their efforts to recognise the victims of drug violence and to keep mobilizing because this was what forced Calderon to enter dialogue with him. Although his influence over government policy remains limited, Sicilia has proved an inspirational figure, leading thousands of Mexicans to reassert their right to live in peace and dignity. In a press conference following his speech at the University of Guadalajara, Javier Sicilia was interrupted by a distraught mother whose son disappeared earlier this year. Arana Aguilar was last seen on January 17. He left his house at 11 a.m. and was driving on the freeway from Mexico City to Guadalajara. His vehicle was later found in Manzanillo. If you have information regarding the disappearance of Jose Luis Arana Aguilar please call Maria Guadalupe Aguilar Jauregui on (33)1410-0216 or 3689-7426.